According to Rob Moseley of goducks.com, the Ducks second practice in Los Angeles yesterday was low-key. A lot of good things happened during practice, but most players were not wearing pads, so the mood was more on detail rather than physicality. As practice broke, players noticed a familiar face on the sidelines, sporting crutches and a knee brace….. it was Pharoah Brown. Since suffering one of the most gruesome leg injuries ever captured on tape against Utah on November 8th, Brown has been back in his native Cleveland, Ohio rehabbing his leg. Players were visibly and emotionally heartbroken after seeing their own get carted off the field with such a bad injury. The only contact players and coaches have had with Brown since the injury has been via phone, marking this moment post-practice the first time he was seeing everybody since the injury. It’s not as if the Ducks need any more motivation. 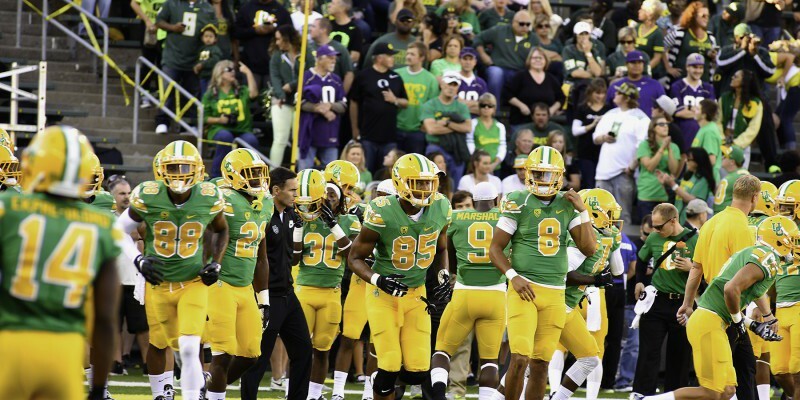 A 12-1 season capped off with a Pac-12 Championship and a Heisman trophy winner, the Ducks have all the motivation in the world to go into the Rose Bowl on New Year’s Day and put away a team in Florida State that has not lost in over two years. Having a leader back on the sideline, like Brown, gives players an extra boost of emotion. Practice is only ramping up from here. Stay tuned to FishDuck.com, as we will continue to bring you all important practice-related news leading up to the Rose Bowl game on New Year’s day.